There are many driveway pavers to choose from when installing your blacktop driveway or asphalt driveway, but only Everlast Blacktop has the experience and reputation for customer service you can trust. For over 25 years we have been providing exceptional driveway sealcoating and driveway paving in and around the Oak Brook area. Our highly skilled asphalt driveway crews are committed to attention to every detail of your driveway paving project. You can rest assured that your new blacktop driveway or asphalt driveway will be completed timely, professionally, and to your exact specifications. In DuPage County, IL, Oak Brook village residents know that premier driveway paving and sealcoating services can be found at Everlast Blacktop. Oak Brook is a small suburb of Chicago with a population of 7,883 and is located approximately 15 miles west of Chicago. It is also home to many commuters. Conveniently located and ready to serve all your blacktop driveway needs Everlast Blacktop promises to keep Oak Brook customers happy. 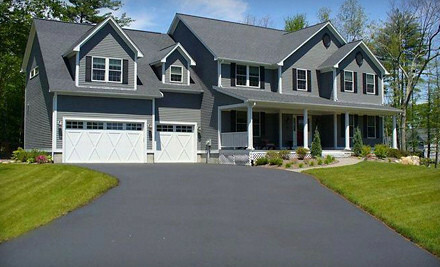 See our gallery of completed asphalt driveway and blacktop driveway projects. Call to schedule your appointment today. At Everlast Blacktop we take great pride in being the leader among driveway pavers for asphalt driveway and driveway sealcoating. We have perfected our craft and can offer many options and solutions for the most challenging blacktop driveway projects. A new asphalt driveway is economical for your residential or business space when you choose Everlast Blacktop. Call us at (630) 855-5572 to schedule your driveway paving services, or to obtain a personalized no-obligation estimate. Your new asphalt driveway is just a quick call away! Why not call today and get started!